If your vehicle has a factory fitted remote locking system, you can convert it into a full alarm system with the Autowatch 375 CLAM. The existing key-fob remote ‘plip’ will continue to lock and unlock your car as normal, but will simultaneously control the Autowatch 375 CLAM alarm system to provide additional protection for your vehicle and valuables. 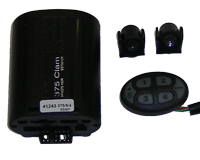 The Autowatch 375 CLAM alarm system incorporates several sensing systems to protect your vehicle. Each time the alarm system is turned on, these sensing systems start to monitor the vehicle and if an unauthorised interference is detected, the alarm system is triggered. As you lock or unlock your vehicle with the factory remote ‘plip’, the 375 CLAM will provide both visual and audible confimation that the alarm system is operating. The Alarm light (LED) fitted on the dashboard also indicates the status of the alarm and provides a visual deterrent to thieves.